We request you to use the information below to contact us. We have not included a guest book type feature to receive reader's views. We feel that people who wish to contact us and provide valuable feedback would wish to say something specific which may require a response. 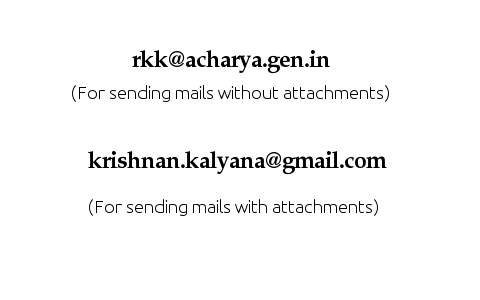 Hence the request for email. We would appreciate hearing from viewers about problems they face in using the search feature. As explained in the page about the rationale behind the search, the current approach is quite arbitrary and may lack the provision to quickly locate words and phrases. Also, it may be pointed out that occasionally a resulting word will have a spelling error. We shall be grateful for such information when you locate such cases. Please mail the context (Volume, Word-type and the query).